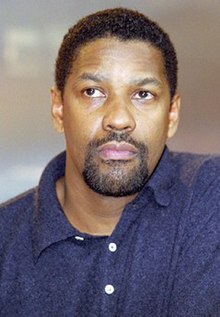 Denzel Washington Berolini (anno 2000). Denzel Hayes Washington, Minor (natus in urbe Monte Vernonio Novi Eboraci die 28 Decembris 1954), est histrio Americanus, qui secundus civis Americanus ex Africa ortus post Sydney Poitier anno 2002 praemium Academiae ut actor optimus in pellicula Training Day accepit. Vicimedia Communia plura habent quae ad Denzel Washington spectant.